Let me tell you about this really cool bike ride my dad and I went on. It's called the Seaside Route. 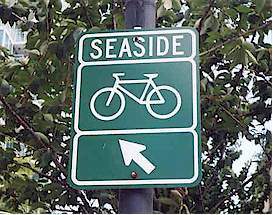 The Seaside Route is the longest ride we've ever taken -- about 30 km -- but it seems shorter, because it's all flat. You heard me -- No Hills! Perfect for rollerblading, scootering, walking, or biking. 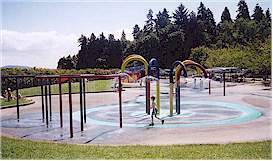 We started off at Stanley Park and went all the way around the Seawall. 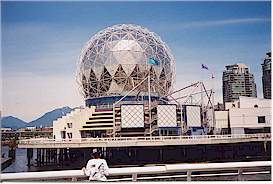 Then we cruised through the old Expo 86 grounds until we hit Science World. From there we had to detour on to the road for about 3 blocks to get under the Cambie Street bridge. But we cut back down to the water at Spyglass place. After that it was clear sailing to Granville Island, Vanier Park, and Kitsilano Beach. I have to admit I was glad to hear dad say "Let's call it quits here, and save Spanish Banks for the next time." My legs felt like strands of cooked spaghetti. At least I wasn't as bad as dad, he couldn't walk straight for days. Mom came with our minivan to take us home. We probably bored her silly with out talk about all the neat things we saw -- a man riding a bike with a python snake curled around his neck. I thought I saw the python smiling. I saw kids of all ages along the seaside route; babies in strollers or those mini cars attached to the back of bikes, some kids were riding tricycles and four wheelers. The best part is you don't have to go all the way. Just take it one piece at a time. 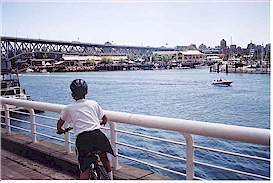 But mostly there's adults either riding walking, jogging, or riding their bikes. This is one of the best bike rides I've ever been on. It's pretty because 95% of the time you're alongside the water. You get to see the North Shore mountains and the Vancouver city sky line. 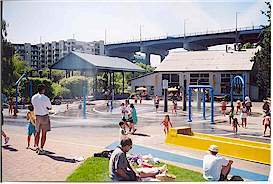 It's interesting because you pass by loads of spots tourists stop for like the totem poles at Stanley Park, Siwash Rock, and Granville Island. 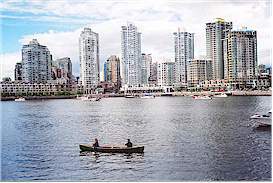 We even saw some dragon boats racing in False Creek. Plus there's lots of different activities buzzing around all the time. I wouldn't advise you to the whole distance if you don't ride much. It took us about 4 hours. Jen my 6 year old sister would never make it. Plus there's a few patches where you have to go on the road -- so watch out. But there are shortcuts you can take, like the Burrard and Cambie Street bridges. Don't forget to have someone meet you at the end. I don't think the ride back would be as fun. We stopped off at Denman Street so Dad could grab a donair at his favourite souvlaki joint. 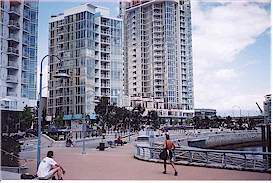 The Seaside Route starts (or ends depending on your direction) near Canada Place, goes around Stanley Park, continues along False Creek, past Granville Island, and all the way to the University of BC. 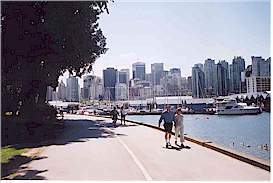 The 8.8 km Stanley Park section of the seawall took over 60 years to complete. 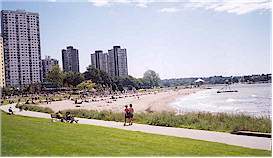 Started in 1917 as a project to reduce shore erosion, much of the seawall can be credited to Master Stone Mason James Cunningham who supervised the construction of the seawall for over 30 years. 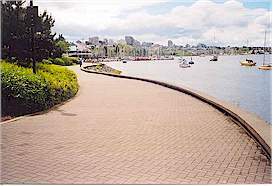 The final portion of the seawall at the Siwash Rock area was completed in 1980. I can tell you how this outing rates high on the adult funometer. Dad kept saying " Isn't this fun Nate?" And even though his leg were stiff for days, he was making plans for our next trip. I guess mom doesn't let him out much. This is a great way to spend a day off with your family.